I adjust the camera on the tripod, hit the record button, and dash back to resume my casual position on the bed. The clicking sound of the camera’s shutters tells me that it’s started filming. “Hey, darlings! It’s Saige Copeland,” I chirp, shooting the video camera a winning smile that would put any Hollywood star to shame. Today, my crazy schedule has a rare blank space: no parties, no dates, no riding competitions, just a blissfully boring day to relax. I’ve decided to spend it creating content for my popular YouTube channel, SaigeVlogs. The first time Izzy agreed to make a video with me, someone had made fun of her outfit, saying she looked like a kindergartener. Pictures went viral, and she’s been reluctant to appear on my channel ever since. I’ve vowed to do everything in my power to make sure it never happens again, even if that means scrolling through every single response and deleting any hurtful ones. Hesitantly, she walks into view and introduces herself to the camera. She blushes as she puts the sign on the floor, her hazel eyes scrunching up happily. 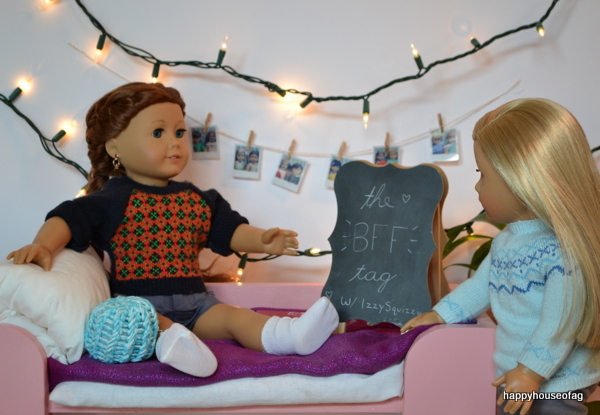 “What’s the BFF Tag?” she asks, curling up on the bed with me and wiggling her toes nervously. “I’m so, so glad we got over that,” Izzy murmurs under her breath, and I nod. “Of course! Saige’s is Red Riding Hood, because of all her red hair,” Izzy says. “Hey Violet!” we chorus as I whip out my phone and start playing music. We belt the lyrics to O.D.D. together — “I’m the girl in the back of the class, pink hair but I’m wearing all black.”— while Izzy flips around her magenta hair extensions. Another easy one. “You love gold, which your eyeshadow makes pretty obvious,” I point out, and she flutters her eyes, showing off the sparkly makeup. “You know it,” she smiles. “Your favorites are the primary colors, right? Because you’re an artist.” She says the last word in an exaggerated French accent. I can feel her relaxing and acting sillier as we go on, and it makes me happy. #5: How long does it take for her to get ready in the morning? She rolls her eyes. That’s fine; I know I did an incredible job. My back-to-school picture on Instagram had gotten thousands of likes. #6: What’s her dream job? #7: What’s your favorite memory together? We burst into laughter, so hard that we can’t manage any words. It’s such a wild story. Catching myself before I snort on camera, I wipe joyous tears from my eyes and recall that fateful day in the summer of 2015. “Tween Spy Organization,” my best friend clarifies helpfully. #8: What’s always in her bag? Izzy claps her hands together cheerfully. “Oh, I know this one!” she exclaims. Springing eagerly off the bed, she rushes off to find our purses. Our favorite bags are tossed onto the bed: mine from New Mexico, decorated with a traditional Navajo pattern; and hers, glittery, gold, and modern. Counting on her manicured fingers, Izzy lists my necessities. “Well, you always have your mini art kit, with the watercolors and tiny little paintbrush. And some emergency makeup, plus that teeny tripod for your phone in case there’s a vlogging opportunity.” She shoots me a wondering look, silently asking if she’s named everything. And of course she has. “I’ll never tell,” she smirks, and winks. #9: What’s her favorite sport? She doesn’t, Izzy mouths at the camera. I knock my sock-clad feet against hers, like Shut up! What Does My Brother Know About American Girl? What’s my blog called, and how long have I had it? C: Happy House of AG, obviously. And I’m going to say you’ve had it since 2014. Me: I . . . actually don’t know how long I’ve had it. Let me look it up. C: How am I supposed to answer these if you don’t even know? Me: Oh, dang, you are right. How did I first learn about AG? C: I almost want to say from toy catalogs. Or internet advertisements? A person? I don’t know. Oh, it was from our uncle! Me: Yeah, he bought me the Kaya series. How many dolls do I have? C: Is it higher than fourteen? Me: Let me count. Um, no. C: Is it lower than twelve? C: Then it’s either twelve, thirteen, or fourteen. Thirteen, that’s my answer. 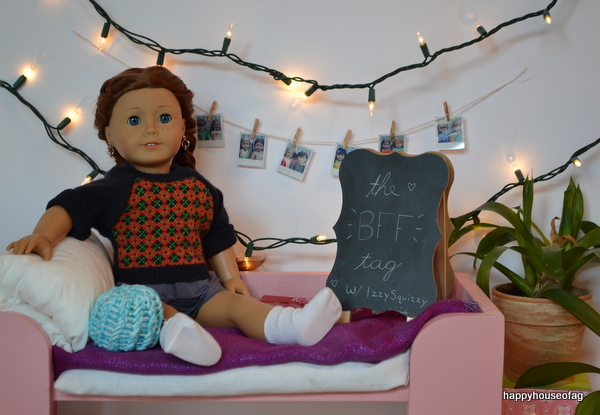 Who was my first American Girl doll? Me: You actually knew that one! 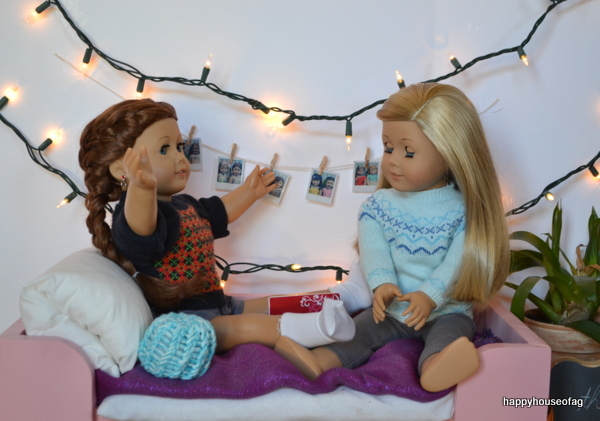 C: Duh, of course I know your first doll. It’s been staring at me for the past four years. Me: More than four years, actually. I got her in 2012. C: Fine, almost six years. Who is my newest doll? C: Oh, wait! S. Is it Savannah? C: Wait. Parker! It’s Parker. 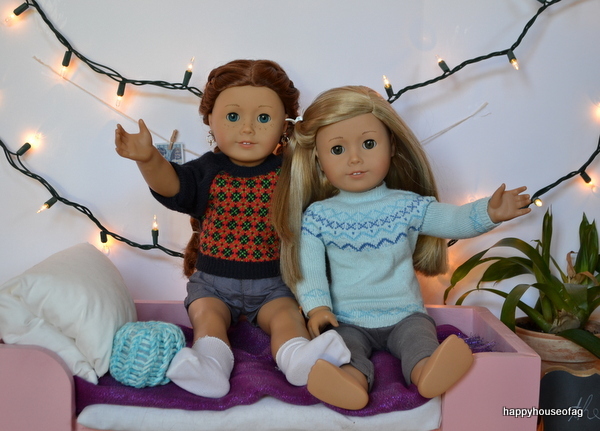 What’s the one AG doll that I’ve always wanted? Which internet friend did I meet this year? C: She was blonde. Right? Me: No. But she has the same name as one of my friends. 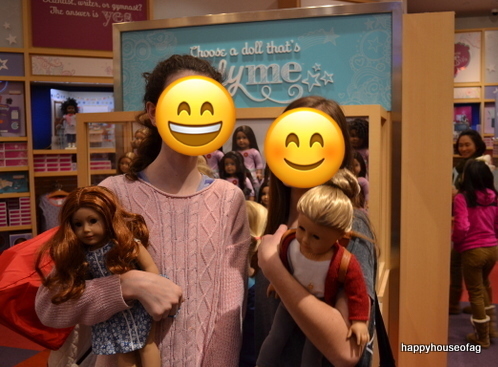 How many times have I been to the American Girl store? C: Somewhere between zero and infinity. Me: I don’t actually know. 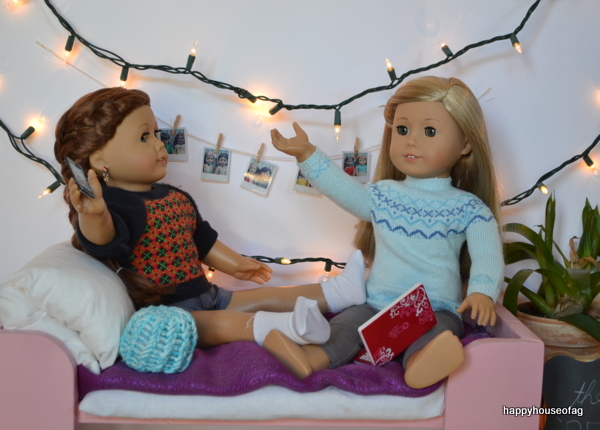 Which of my friends like American Girl? C: Isabelle, and . . . *deep look of concentration* Megan? Me: She used to have one. C: So it kind of counts. My mom: Kelsie and Kelly. C: Does Bethany like them? Me: No, but her sisters have begged me to give them my dolls. What’s my most popular photostory series? C: Well, there are only like three photostories that you’ve actually finished. Road to Pamel? C: Is it the spy one? Me: Nah, that was more like a mini series. Before it was American Girl, what was the company called? Who is the current GOTY? C: She’s Brazilian, isn’t she? Me: That’s not even American. Me: That’s last year’s. The Brazilian one. C: Is she African American? Me: Yes. But you don’t know anything else, do you? Me: *brings up a picture* Her name is Gabriela McBride. Which GOTY do I look like the most? C: *points at Marisol* That one looks homeless. Me: It was 2000’s fashion. It’s true, I looked just like her (except for the freckles) when I had side bangs. C: *points at Grace* You look like that one. Me: Do you know what her name is? Me: Grace Thomas. My MJ. C: Oh, the one who lives in France. Which BeForever doll is your favorite? C: Will I have to give a reason? C: Kit, because . . . she’ll die the earliest. C: Yeah, lots of people died from starvation during the Great Depression. Did you know that AG made a boy doll? C: . . . Yes. Me: What? No, that’s wrong. C: Oh, sorry, that was from Our Generation. Is it Steven? C: Dan? Greg? Colin? What do you want from me? C: Ugh, that’s hideous. Just like the rest of them. He actually got most of them right, which is pretty surprising! I’ve got to say, I’m kind of proud of him. Maybe. When I first asked him to help me with this, he was rather uncooperative. He said he would answer selectively. But by the end, he was getting really into it. Are there more doll-related questions you’d like my brother to answer? Leave them in the comments, and I’ll get C to make another appearance on my blog sometime. 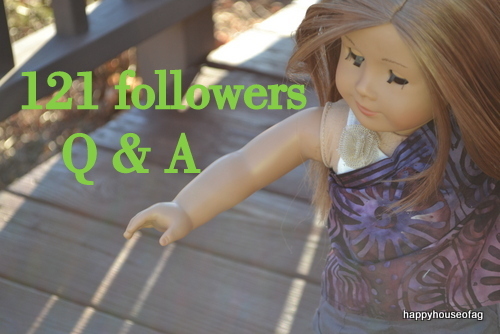 Thanks for all the questions on my 121 Followers Q & A post, guys! 1. Who was your first doll? 2. Do you think you’ll ever outgrow your dolls? I don’t want to say this, but, probably, yes. There are times that I’m super into dolls, and then times where they wear the same clothes for months and I pay them zero attention. Do you think you’ll ever quit dolls? Same answer I gave to Clara. How many times have you been to the AG store? I like lime green, black, and any shade of blue. What is your favorite doll that you own? I’m only going to say this once. *covers all the dolls’ ears. Wow I must be a mutated octopus to do that* Savannah. What is your favorite doll that you don’t own? Um. Well. Like a billion dolls. But I really like Truly Me #24. What doll brands, other than AG, do you like? Ever After High and H4H. What is your favorite photoshoot you have done? Well, um, I’m going to say my favorite PS for each doll. Saige: I’ve done about a gazillion photoshoots of her for OOTW and other stuff so I can’t really choose. What is your favorite photo story (or photo story series) you have done? What is your favorite post you have ever done? What is your favorite writing blog? Um . . . I’m not sure . . . I don’t read writing blogs as much as I probably should. What are you favorite books/authors? You shouldn’t have asked that. Percy Jackson series, all the books by Liz Kessler, all the books by Rebecca Stead, The 39 Clues series, the Secret series, The Hunger Games, the How to Train Your Dragon series by Cressida Cowell, tons of other books that I can’t remember . . .
Other than AG and writing, what are your favorite things? Pizza, soccer, cats, my best friends, photography, Netflix, Doctor Who, books . . . Which bloggers do you know in real life? I know four bloggers, but I’m not allowed to say which ones. What is the biggest AG store you have been to? I’ve only ever been to the D.C. one, so . . . that one? What doll do you want next? What do you want GOTY 2016 to look like and what would her hobby be? Well . . . *taps fingers together evilly* She would love hunting! And then American Girl could sell doll sized rifles and bows and tree stands and deer carcasses . . . Maybe not the carcass part (What about deer jerky from a deer she shot? ), but you get the idea. She would have wavy black hair, brown eyes and freckles. And there would be no pink in her collection! She’d probably come in a camo jacket, plain jeans and hiking boots, and a beanie. What is your favorite GOTY that you own? Probably a tie between Saige and MJ (Sorry, Izzy). I used to play the flute, and I would like to play guitar and piano. On average, do you know how many books you read each summer? If you had to move and could only pack ONE doll, who would it be? Please don’t make me choose. If you could only buy TWO more dolls, which ones would you pick? Um, let’s see . . . I like cats, foxes, unicorns and dragons. What camera do you take pictures with? I use my mom’s camera, a Nikon SLR D3100. Counting Stars by One Republic. Would you rather doodle or draw realistically? Doodle, because drawing is not my strong point. I usually draw tiny pictures of characters in stories I’m writing. Ew, ew, ew, not Schnauzers. My grandma has mini Schnauzers and they are unpleasant little things (no offense to anyone that likes Schnauzers — we all have different opinions). I’d totally go with Labradors. 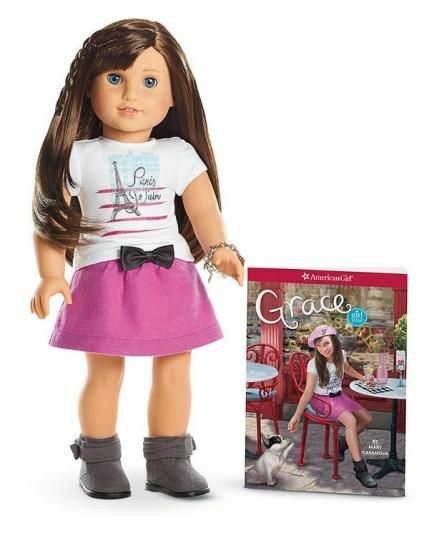 The Grace doll or the Mia doll? Probably Grace, although I do love Mia. Which GOTY would you like to own? Oh wow, there are so many . . . but the two that I’d really like are Jess and Kanani. How many people have you helped to start a blog? Which of your dolls has the most unique personality? Why did you choose these dolls for your collection, was there something special about them, who spoke to you the most? 3. 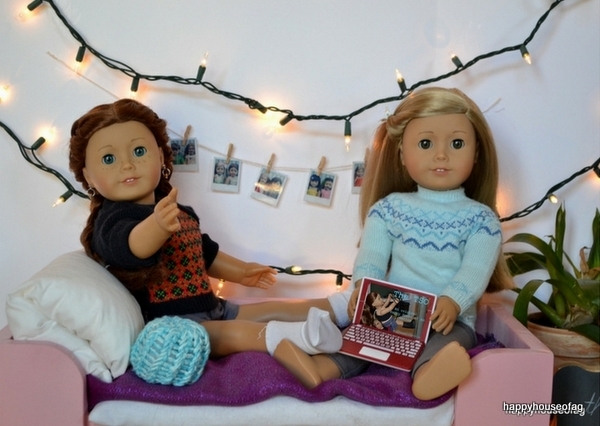 How did you find out about American Girl? My aunt and uncle sent me American Girl books, and there was a “send this in for a free catalog” thingy in the back of the books. So one day I sent the ecobob in, and my brain was filled with dolls. Very involved answer that has to do with Tracy coming right up . 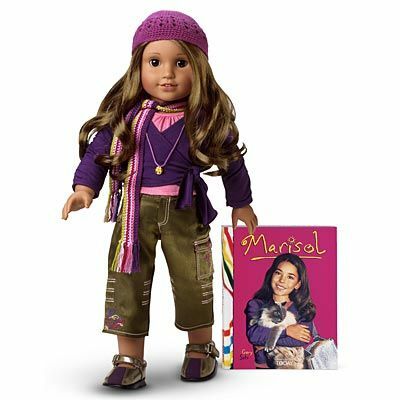 . .
My mom didn’t want me to get an American Girl doll because she thought they were too expensive and didn’t think they were better quality than Target dolls. I really wanted one, though, so for my birthday, my parents gave my fifty dollars to buy Tracy with. When my beautiful doll arrived, Mom was very impressed by how well made they were, and proceeded to buy Caroline for me at Christmas. I’m not actually sure what that had to do with the question. Anyway, moving on . . . Wait! I remember now. You could tell your parents that American Girl dolls are really good quality and show them reviews of the doll you want. For your birthday or Christmas, they might give you money to buy a doll with. Pick one doll. Where does that doll want to visit? How old were you when you started collecting dolls? I don’t know. I had been collecting dolls for a long time before Tracy came along. Will you ever do any more giveaways? Erm . . . probably. I was working on a giveaway but for some reason it didn’t get finished. Do you have, or do you want a YouTube? I don’t have a Youtube, although I had been thinking about getting one. But then I decided that stopmotion is too hard. Do you have an Etsy? If you could only buy one more big accessory (like a bed, or Samantha’s Ice Cream Parlor), what would it be? Who is your dream doll? Which doll that you have looks most like you? Which TM doll looks most like you? #39. But if you put Molly’s eyes on #57, she would look like me. Which one of your dolls (if you had to pick one of your dolls) would be your first choice to recommend to someone? We have some fish and we used to have fire-bellied toads. 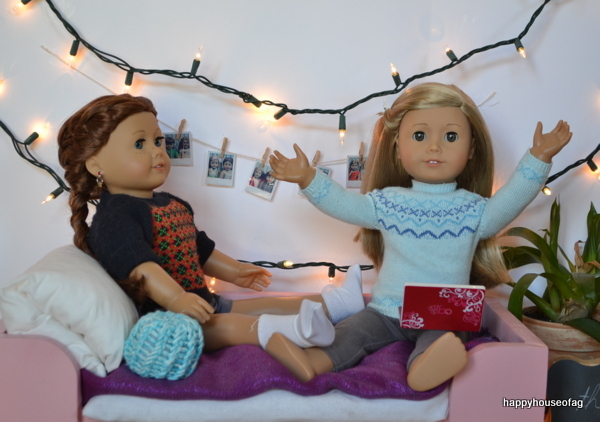 Do you sew for your dolls? If so, what was the first thing you sewed for them? 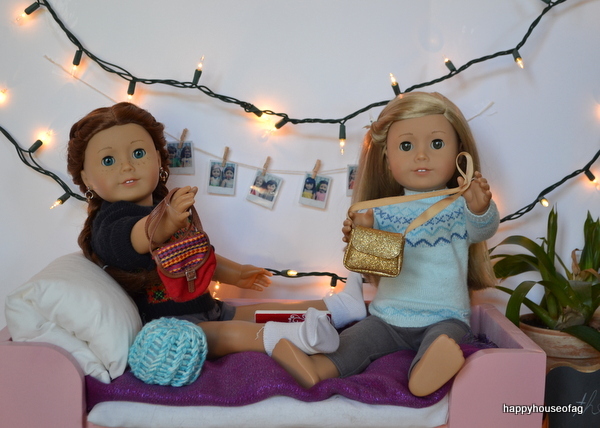 The first big thing I sewed for them was the outfit in this post. If you were to have a doll with wild colored hair (pink, blue, etc.) what color hair would it be? Which do you prefer: GOTY or HC (BeForever)? BeForever, because the dolls always have such beautiful outfits. 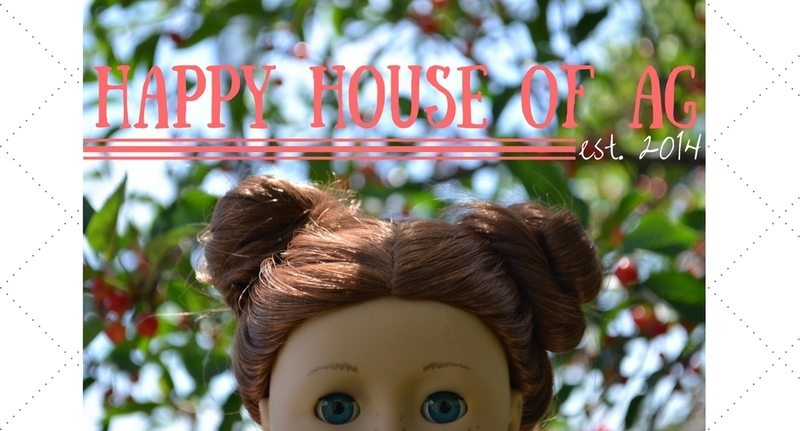 Because I like dolls, writing, and photography! Bees don’t scare me, and I’ve never been stung by one. But I have been stung by hornets three times! What advice would you give to starting bloggers? Good grammar. Grammar is important. And try to mix up what kind of posts you do. So if you really like doing photoshoots, maybe put a review in there sometime. Also, sometimes when you start blogging, you’ll have tons of ideas for posts and want to post more than one thing a day. But being bombarded by posts can get annoying to the reader. How do you come up with ideas for your photostories? I pick a main character, select one of their hobbies, and then put a twist in there! Take my Gymnast’s Honor post for example. Ivy is doing gymnastics, her hobby, when there is quite literally a twist! Do you have a dollhouse? And if so where is it and how much do you have in it/use it? I do have a dollhouse, and it is in my basement. It’s stuffed (except for the bottom floor) and most of the pictures for my photostories are taken there. What doll do you plan to get next? Either Truly Me #24 or #37. 2. How many AG pets do you have? Four: Chocolate Chip, Coconut, Rembrandt, and a Siamese cat. 3. 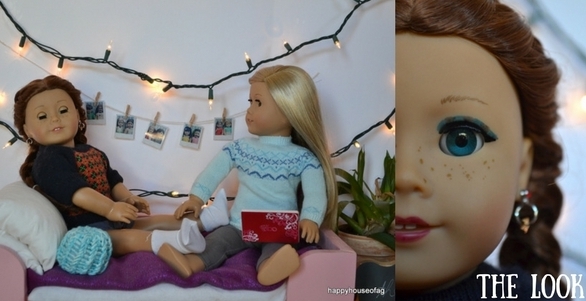 Do you sew things for your dolls? 4. What is your favorite doll blog? There are so many amazing ones out there. I can’t choose! Do you like to look back at your own old posts? Yes, it’s a lot of fun! Who is your favorite doll? 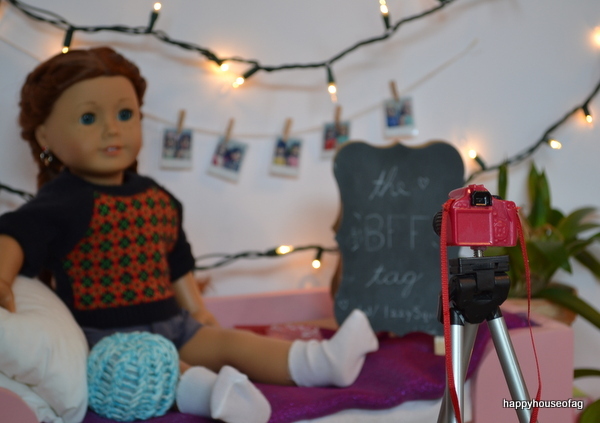 Do you sew doll clothing? What is your favorite outfit to put Savannah in? Oh, that’s a hard question . . . Well, Savannah looks really good in the Our Generation Jumping for Joy outfit! And this outfit. And . . . let’s just say that she looks good in practically anything! Favorite doll outfit you own? Um . . . Maybe the Striped Hoodie Outfit? The Sunny Isle Outfit? idk. Next doll on your wish list? Favorite photoshoot you ever did? Which AGP is closest to you? I like going to the mountains. We’ve discussed this . . . I am physically incapable of choosing a favorite book. Um . . . I don’t know. Movies don’t really stick with me. Your favorite doll if you can choose? Kathleen knows . . . If you could design your own AG doll with a story what would she look like? What would her story be about? She would love hunting! And then American Girl could sell doll sized rifles and bows and tree stands and deer carcasses . . . Maybe not the carcass part (What about deer jerky from a deer she shot? ), but you get the idea. She would have wavy black hair, brown eyes and freckles. And there would be no pink in her collection! She’d probably come in a camo jacket, plain jeans and hiking boots, and a beanie. I don’t know what her story would be about. Annoying people scaring away her prey, maybe. But I know for a fact that it wouldn’t be about things like not fitting in at school. Oh, oh, what if she was homeschooled? That’s all the questions! I must say that my Q & A experience was fun but also hard . . . apparently I don’t know myself as I well as I thought I did . . .
Well. Now you know me better than you probably wanted to. P.S. This post was has 2339 words!